With the wide range of lift capacities and lift heights, Cat Telehandlers give you the strength and power to take loads up and out. Spacious cab and suspension seat keep you comfortable all day long. Three steering modes offer improved maneuverability on any terrain. Single lever joystick contains all boom functions for easy operation. Hydraulic stabilizers for the TL Series models provide extra support and increased capacity at reach for work on any terrain. 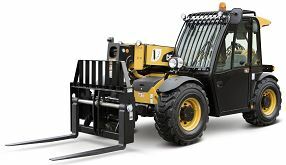 TL943D 111.3 26,852 9,000 43'0"
Kelly Tractor Co. is the authorized Caterpillar dealer for South Florida. We offer Caterpillar Telehandlers for sale, lease, rent and have a large selection of used Caterpillar equipment. We also carry Caterpillar telehandler parts and we offer excellent product support. Headquartered in Miami, FL we have stores in: Miami, Davie, West Palm Beach, Fort Myers and Clewiston. For more information, please contact us at 305-592-5360.